The other night, I couldn’t find Hubs. I searched the entire house, but he was nowhere to be found. I saw the door of my craft room was closed so opened it. There he was sitting at my desk in my new craft room, papers everywhere, looking very at home! Oh no. We cannot have that. Obviously if I was going to prevent a coup d’etat immediate action needed to be taken. Hubs needed his own desk and “new” workspace, and he needed it NOW. While Hubs was out of town this past weekend, I went into action. I searched the basement (which holds lots of treasures for such a time as this) and found this coffee table that I picked off the curb like…2 years ago. I’m a sucker for any piece of furniture that is real wood and has details. This piece had me at “scrolly flower”. I first cleaned the entire thing with TSP which you can find at any home improvement store. It’s great for taking off all of the dirt, grease, grime, and scary spiders. Here you can see where I cleaned and where I hadn’t yet. Ew. This baby was nasty! And here she is all fresh from her bath. So much better! Next, I bought some parsons legs (because those were the only cheap legs available at Home Depot in a set of four), and I drilled a hole in the existing legs of my table. Do I look cold? I was. It was freezing. Oh the sacrifices one is willing to make in order to protect one’s personal space! After I drilled my holes, I applied a liberal amount of Gorilla Glue in each hole and on the base. But those little do-dabs costs $9 for a pack of 10, and I’m cheap. So I improvised a bit and just screwed the legs into the holes, glued the bejabbers out of it, and prayed it wouldn’t collapse. I’m not going to lie. It’s a bit precarious at this point and I wouldn’t make any sudden movements at it, but it works for now. After priming everything, I filled the joints of each leg with wood filler. Yes, it looks bad here, but all you do is…..
…sand it and it looks much, much better! Finally, I gave her several coats of Rustoleum Gloss White and she now looks like a super star! I was going to distress her just a bit, but let’s be honest here. This desk is totally girly, and I wanted Hubs to accept her as his own. If I distressed her, he might have rejected her and I wasn’t willing to take that risk! This room is our library/ guest room. We have four floor-to-ceiling bookshelves filled to the gills with Hubs’ books and could easily have four more. The room needs a little makeover, but it’s not going to happen until next Spring. I want to paint all of those Ikea bookshelves white, but I barely got this desk painted without freezing my tail off! Sob. I’m afraid that spray paint days are over for awhile for us Northeastern girls. So what do you think? Could you see yourself working here? Would it keep you out of my craft room :)? I am linking up my before and after project to Sarah’s party and Kim’s party! Check them out for some more inspiration. Also, don’t forget to enter the $25 stamped jewelry gift certificate from Simple Starfish! And my Willow House sponsor is holding a $50 gift certificate giveaway HERE. Willow House specials for November include: Spend $39.96 and get ANY item $40 and under for 50% off + 25% off items on the weekly deals! I just wanted to say thank you! I picked up a used dining table at Goodwill this weekend (after searching for the perfect non-laminated, non-particle board desk to fix up) for $10 and a large board at a home store and was trying to figure out how to make my own desk..I saw your pin and remembered the perfect coffee table I had in my garage, even has a drawer in it! And the legs from the dining table fit PERFECTLY, all I had to do was drill an extra hole! Now I’m just waiting for the weather to clear up so I can paint it all a fresh white and the vintage chair I found a turquoise…I live in Minnesota so it could take a while! Yesterday was 60 and sunny, today they have a winter weather advisory out! Anyway, thanks for the idea of using the coffee table for a desk, it worked out perfect for me, and will look a lot better than the $100 cheapo desks you buy in the stores! That is gorgeous! I want it for myself! I keep my eye out for stuff like this and never find something so awesome. Someday I'll hit the jackpot! Oh my!!! 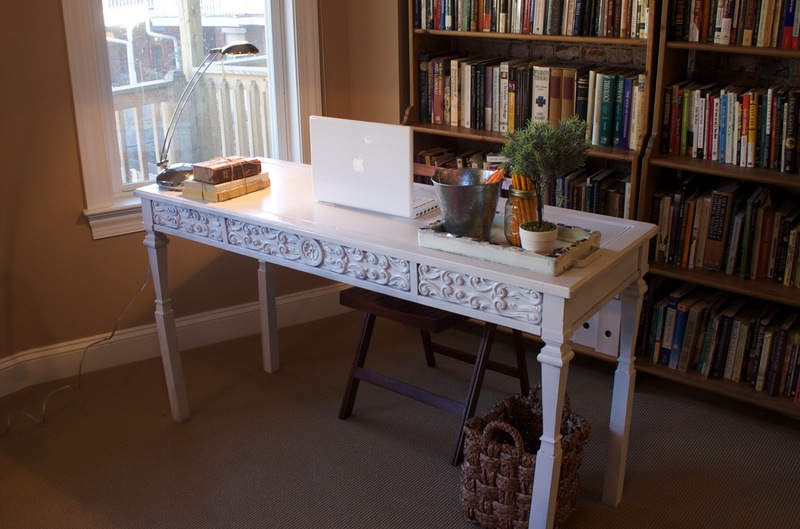 I've got that exact same table….I got it at Goodwill for $7.00!!! It's on my list to turn it into a bench w/cushion. Keep on eye on my blog….it'll make it there soon now! Great job!! I'd even trade your hubby for that desk lol. Fantastic job! I cringed when I saw the photo of you all bundled up! UGH cold weather. Beth, I think he's going to love it and YOU..
Great job….yup it's getting cold. This looks fabulous! I never knew there was an attachment kit. Even though you didn't use it, you did an awesome job. Gorgeous! Great. Where were you when I was buying a craptastic desk from Target. Oh the shame! I seriously want to go garage saleing w/ you! I would have never thought to add legs to a coffee table to add the height! I bet your hubby loved it!! So glad you were on the job right away! My hubby is slowly taking over, and I'm having to stand my ground. You know what they say, "snooze, ya lose!" You sure know how to make things work. The desk is beautiful. I love it!! It looks great! What a clever idea to turn in into a table. I will have to remember that one! That is a great idea! On my way to find a coffee table. . .
OH MY Garsh…you clever girl. Love how this turned out and the leg idea!!! AMAZING! Looking like it was made to be a desk. Although I'm partial to benches…hee hee. Love this funny post and the table turned desk is really pretty, don't tell the husband I said pretty though, ha! I've seen people cut legs off to make a coffee table, but I don't think I've ever seen the reverse until now. Awesome! Clever, clever!! I would have just complained until he left my craft room alone but you are a woman of action!! Good for you!! Hope he likes it! I do! It is frosty this morning …brrrr. The desk looks great and I hope it does the trick. You did a great job coming up with a low cost solutuon …. even if the legs might wobble a bit. 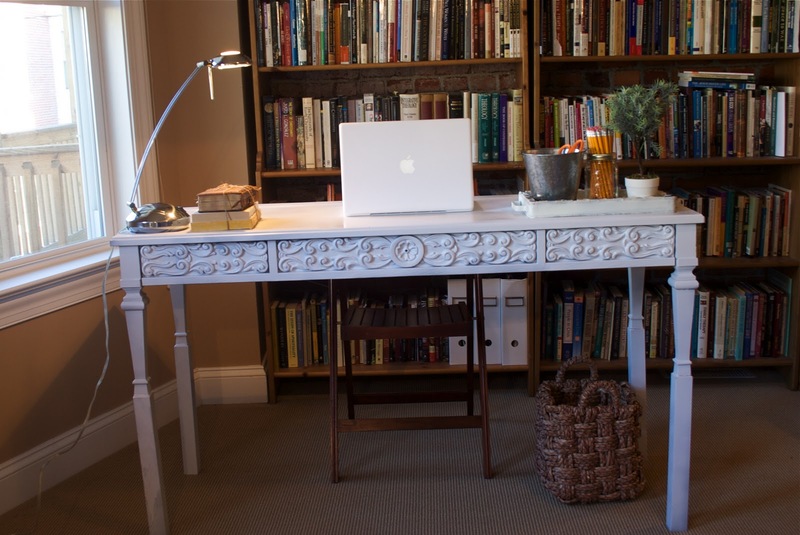 Love that office and the way you accessorized the desk. Let us know if he likes it. Oh goodness Beth…..it’s stunning! Love the color, the lines, the way you accessorized it, how it pops off the dark book shelf!!! You did a superb job and you used power tools. I have not mastered them yet. I think I should get sewing down 1st! It is wonderful, Beth! I am still trying to get over the fact that you found it! Well hello, gorgeous! You're a genius. I sure hope Matt appreciates the freezing of the tail that went on in order for you to get him out of your craft room…errr…to get him a new desk. This is actually very funny! Can't we all relate to wanting our personal space to ourselves. Your solution is amazing! You are really creative! Beth, I applaud your creativity in coming up with a desk for your hubby. My hubby's desk is a vintage dining table that I got for $25 & it works perfect for him. Yay on a job well done. Even if it was freezing cold. It's still 80* down here. It's so pretty, I might want to think of a trade ;). I love the scrollies, too. Wow. I love how you just went for it!! It looks great!! Love it! It would have had me at scrolly detail too! I think it looks great! Now aren't you just the clever one. Awesome job. Looks great. Great eye to spot that piece. I love the carved detail. Now it has a new life and looks so fabulous in white. That was amazing! I love to "glue the bejabbers" out of stuff too! You're funny. She's totally cute! Maybe you just need a little stabalizer leg between the back two and then between the two sides? Would that help it be less wobbly? I love it! You did a great job. It turned out beautiful. I love all the detail and that flower is so cute! The desk looks great and it matches that wonderful Imac perfectly. I hope hubs got the message and stays out of your craftroom. Just threaten him that otherwise you will turn the library into your craft room too. I'll keep my fingers crossed those legs will keep it up (I actually like it very much on its high legs, much better than as a coffee table).